It’s a new year and as is expected, the hot discussion of the moment revolves around what people are doing to make changes in 2015 by way of the classic new year’s resolution. Some people shy away from resolutions altogether, vowing that making drastic choices or changes need not be limited to the first day of each new year. Others resolve to do or change something but it can often revolve around adjusting an existing behavior from the previous year. What about just deciding to add something totally new to one’s skill set this year? Trying to do something new at the start of a year is a great benchmark because it is easy to keep track of ee versus progress. Those who reside in the music space are constantly thinking with a creative switch turned on in the back of their minds and for those maybe not so consistently active in the music technology space, looking to branch out for the sake of learning or just to have another form of expression available at their disposal, Axoloti might just be the way to meet this expectation –and help a new project on the verge of changing digital audio programming to boot! Developed by electrical engineer and digital media researcher, Johannes Taelman, Axoloti is a combined software and hardware, platform based system, that allows users to create their own digital sounds via a standalone device. Constructed with the non-engineer/programmer in mind, Axoloti provides a wide range of freedom when crafting a desired sound but does not demand its user have a deep familiarity of coding (a useful factor of differentiation from its “peers” Arduino and Raspberry Pi) in order to take advantage of its features. A crowd funding project just launched only a few days before the year ended, Axoloti is being promoted through a campaign currently active on indiegogo and is geared toward anyone looking to delve into the flexibility of digital synthesizing and programming, without drowning in a sea of technical vernacular and complicated pathway schematics. The software half of Axoloti, referred to as the Axoloti Patcher, is the digital workspace where users start and edit their digital algorithms, as well as program the method of interaction that will trigger the final sounds one chooses. (e.g. MIDI, oscillation, switch) Taelman created Axoloti Patcher using Java but with intention of computer inclusivity, as the software works across PCs, MacOSX and Ubuntu Linux as well. 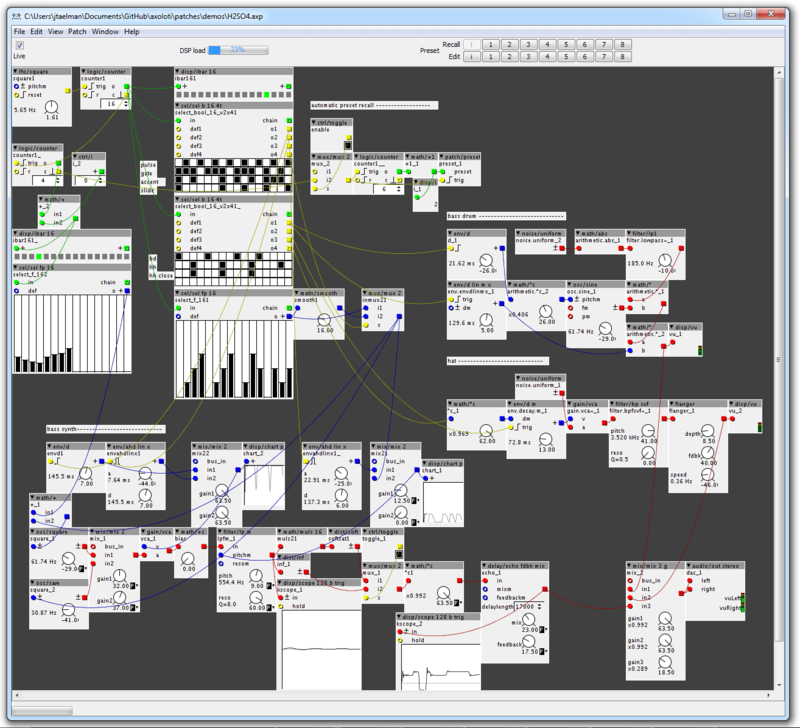 Those who are somewhat versed in programming can think of Patcher’s system being similar to that of Max/MSP programming language. A key point of appeal with Axoloti Patcher’s function is the fact that adjustments are made in a visual, rather than code and typing based, manner much like an analog modular synthesizer where you connect modules with patch cables. After tinkering in Patcher, it takes a mere single click to upload the new ‘diagram’ to the circuit board, referred to as Axoloti Core, which then makes it possible to work away from the computer and even make adjustments to the programmed parameters in real time with a MIDI controller, or, if users stay connected to a computer, adjusting in real time in the Patcher work space. Solder pads for connecting potentiometers, faders, switches, LED’s… (16 signals, ground, 3.3V supply, 5V supply). All I/O is 3.3V signaling. The potential uses of Axoloti stretch as far as one can imagine within programming but to give a good starting idea of some conecepts already well in use, Taelman highlights how Axoloti can be applied to things like: MIDI controllers, instruments with audio output, connecting to self-made amplifiers, creation of a stomp box and even putting together a custom digital musical instrument. Every decision made concerning the Axoloti Core is made with the user’s freedom to create kept as priority. Even things that even might seem like a deficiency, like the lack of a default enclosure, for example, are actually intended to prevent users from being limited by any particular design Taelman might have applied to the Axoloti Core and then possibly restricted what others could do with it on their own. This freedom of creation is then boosted by the fact that Axoloti’s entirely open source internals allow and encourage users to alter and build upon the existing object library. Users from around the world coming together to share extensions, thanks to an open source model like Axoloti, could lead to a shift away from the business models of other music gear manufacturers that often confine users to a set of secret, manufacturer-specific algorithms. Axoloti certainly stands to spark a fresh interest within the sphere of DIY music tech work. Its more user friendly approach to digital signal processing and instrument creation opens the door for a larger number of people to nurture an interest in, and appreciation for, this niche of the music industry. Axoloti was first put in motion early during 2013 and in this short time of just about two years, Taelman has already made several improvements and additions to its capabilities, all while having Axoloti in the hands of real people, used in real, non-controlled situations like Music Hack Days in Amsterdam and Paris, and, the Music Tech Fests held in London, Berlin and Paris. This makes each change and new version of features to Axoloti as well matched and authentically supportive to users as possible, since the works in progress have been ‘field tested’ for various builds, by people of many different technical skill levels, providing more genuine feedback than in a calculated test setting. There is a near full month still remaining in Axoloti’s indiegogo campaign and Taelman is looking to fund series production of more Axoloti systems so they can be utilized by more people, in more audio and music related endeavors. He is also planning to continue working on more features for the Axoloti Core, like frequently sought USB host support. The project goal stands at €25,000, with a current accrual (at time of writing) of about 14% funding. Four level of funding perks are available, with access to an Axoloti Core board available at a €60 donation. It’s only €15 more to ship anywhere in Europe and only €20 / $24 USD more for shipping everywhere else –all the way from Belgium! Crowd funding payments can be made through PayPal, which will make the appropriate currency conversions to donations as necessary.